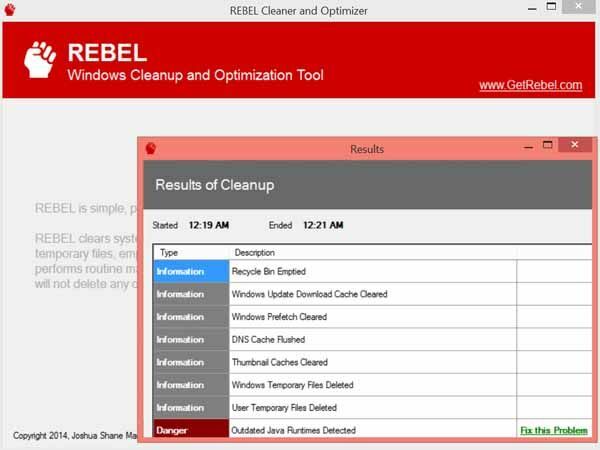 Free download Rebel Cleaner and Optimizer latest version. Simple and powerful, REBEL is a free and open source application designed to clean and optimize your Windows computer. REBEL does this by clearing system caches, deleting temporary files, and performing system health checks using data collected in real-time from the Web. REBEL is simple, powerful, and easy to use. REBEL is developed by Joshua Shane Martin in his spare time. REBEL clears the caches for various Windows systems functions, including Windows Prefetch and the Windows Update Download cache. These caches are designed to improve performance, but can grow so large over time that they actually slow the computer down. REBEL deletes the temporary files created by Windows during normal operations; these files are created not only for each user account, but also for the system itself. Without REBEL, these files would have to be deleted manually. REBEL executes various checks on the system to determine if Windows is running as best as it can. Things like memory usage, disk free space, and physical hardware limits are a part of what REBEL analyzes to determine optimal performance. REBEL analyzes the applications installed on your computer to determine if any of them are on a real-time graylist or blacklist retrieved from the Web; REBEL will let you know if any of these applications have been flagged as questionable, dangerous, or detrimental to the performance of the machine. REBEL scans your computer for any installations of Java, Adobe Reader, or Adobe Flash Player. REBEL will compare the versions installed with the latest versions available, and let you know if you’re running an outdated, possibly vulnerable, version. REBEL is open source, and will always be free (as in dollars and freedom). Licensed under the GNU GPLv3 license, you’re free to review the source code anytime, so you can be sure that REBEL doesn’t do anything behind your back.